Integrated Development Environment or IDE provides a very convenient environment for software development as it automates a lot of boring/complex tasks. Although some programmers do not prefer to use any IDE (specifically ruby programmers – they use TextMate or gedit or other powerful text editors) but java programmers uses IDE in most of the cases because having an IDE makes a lot of jobs much easier. So it means the need of IDE also depends on the type of programming language and the complexity of the project. Since, Java is based on configuration over convention paradigm so an IDE is a must have tool (for Java developers) to automate a lot of tasks, thus it saves a lot of time for coding the actual stuffs. Once you’ve installed the eclipse platform and its dependencies, you can install the required package/plugin for your job. 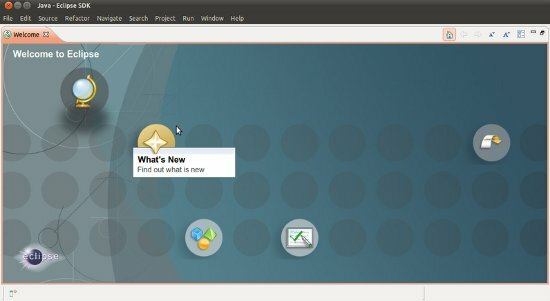 or you can just search in Ubuntu Software Center and install it from there. 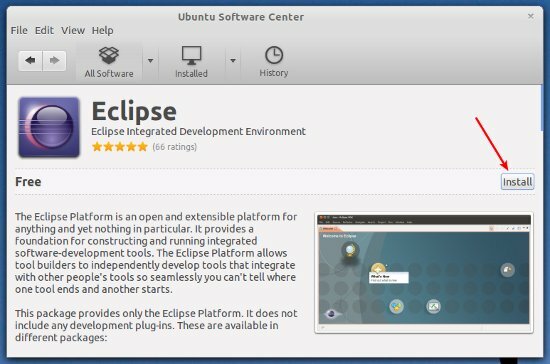 Do you know how can I update eclipse (installed from the repos) to the latest version? #fcastillo, the canonical repositories are not there, yet. For 3.7.1 you would have to install from the command-line (which is easy) or, if somebody has a PPA, you would have to add that to your sources list. Hey Ramesh! – Your contributions with regards install and setup instructions for Ubuntu – Eclipse – JBoss, etc., are VERY well prepared and exceptionally helpful – THANKS for your careful attention to detail and the clear, clean way the tips and additional links are laid out. NICE JOB!! how to install j2ee plugin for eclipse. I got just java plugin alone.. i tried with install software menu also but still facing the issue.